In his third season as head coach, Mark Richt and the Miami Hurricanes are looking to take the next step forward in 2018. Miami (Fla.) finished last season 10-3 overall and 7-1 in the ACC. The Hurricanes return a wealth of experience from last year's team. In his first two seasons as Miami's defensive coordinator, Manny Diaz has reshaped the Hurricanes defense. Last year, Miami (Fla.) ranked 38th overall in total defense and 28th in points allowed. 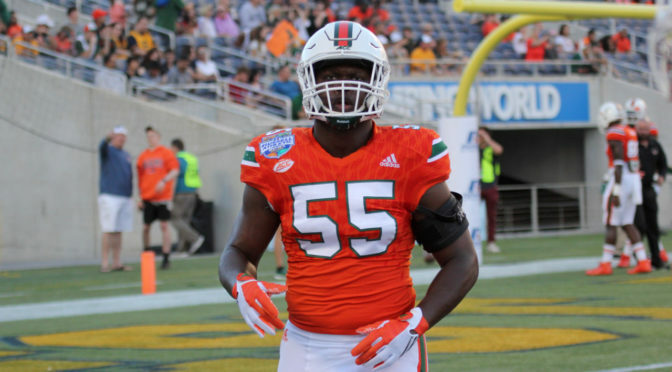 The Hurricanes have NFL-caliber talent at each level of the defense, which includes defensive lineman Joe Jackson (6'5, 258, Jr.), linebacker Shaquille Quarterman (6'1, 250, Jr.) and defensive backs Jaquan Johnson (5'11, 190, Sr.) and Michael Jackson (6'2, 195, Sr.). On offense, quarterback Malik Rosier (6'1, 216, Sr.) will have several weapons at his disposal including wide receiver Ahmmon Richards (6'1, 190, Jr.) and running back Travis Homer (5'11, 195, Jr.). Miami (Fla.) has the talent to win the ACC and possibly accomplish more. Look for Rosier's play at quarterback to determine how far the Hurricanes go in 2018. Johnson (No. 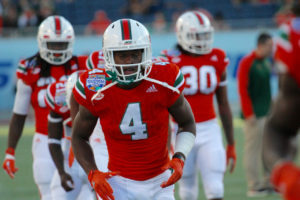 4 pictured) has produced two and a half quarterback sacks, six tackles for loss, four forced fumbles, six interceptions (TD), four pass break-ups and one blocked kick entering his final season for the Hurricanes. The city of Miami has produced some of the best athletes and receivers (i.e. Antonio Brown, T.Y. Hilton) to play in the NFL. Johnson plays on the other side of the ball but is just as gifted. The Hurricanes safety won the ACC Defensive Back of the Week award three straight times last season and led the team with 96 tackles. The senior has a knack for causing turnovers, finishing the 2017 campaign with three forced fumbles and three interceptions. Look for Johnson to have the now infamous Hurricanes "turnover chain" around his neck multiple times in 2018. The Hokies figure to be the Hurricanes stiffest competition in the ACC's Coastal Division in 2018. Miami bested Virginia Tech 28-10 last season at Hard Rock Stadium. However, things could be more challenging in Blacksburg. This game could decide an ACC Championship appearance and possibly put Miami into the College Football Playoff discussion. St. Louis (No. 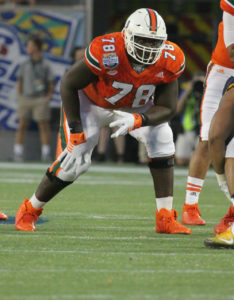 78 pictured) -a former four-star prospect from the IMG Academy (Fla.)- has started the last 21 games of his career. St. Louis heads into his senior season with 21 consecutive starts and he has seen action in each of three years on campus. His mobility and accuracy getting up to the second level (to block LBs, DBs) has been his best attribute up to this point. For him to take his game to an All-ACC level, he needs to play with a lower base. There are too many occasions where he engages in perimeter wrestling matches with a taller disposition. This has caused him issues with pass rushers attacking the bottom of the pocket. Overall, he's been more consistent with his upper body posture. If the former four-star recruit can connect his upper body with his base, he'll have a chance to reach another level in his play. The Hurricanes make their first appearance in the College Football Playoff after cruising through the regular season, according to DraftNasty's Troy Jefferson. The Hurricanes may have caught LSU on a good year as their program transitions to head coach Ed Orgeron in his second full season. The two will open the season in Arlington, Texas. Miami (Fla.) will also play their in-state rival Florida State at home.